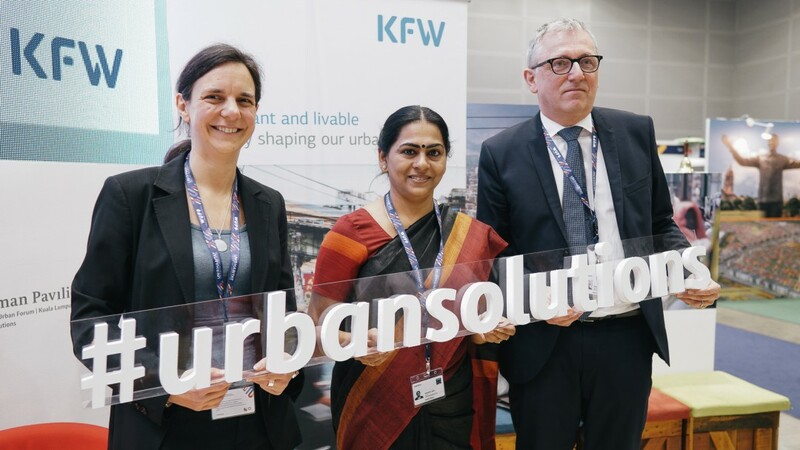 Kirsten Offermanns, KfW, Soumini Jain, Mayor of Kochi, India and Dr Peter Kurz, Mayor of the city of Mannheim, Germany, discussed financing opportunities for cities in the Global South. 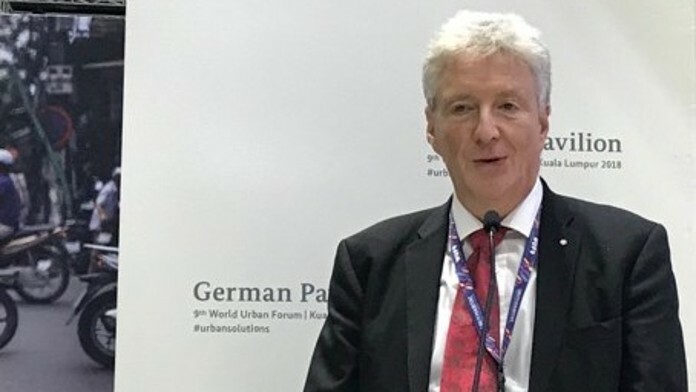 Cities need more money — that was the quintessence of the discussion at a KfW event entitled "Municipal finance in Germany — lessons learnt for developing countries" held in the German pavilion at the World Urban Forum in Kuala Lumpur. But it's not just financing alone that's important, money also needs to be well managed and spent to meet the needs of residents. This is important because more and more people live in cities. Today 50% of the global population lives in cities, by the middle of the century, this figure will reach about 75%. One of the biggest challenges facing cities in the future will be to provide their inhabitants with what they need to live dignified lives. With this aim in mind, the ninth United Nations World Urban Forum, which took place in Malaysia from 7 to 13 February, was held this year under the motto "Cities 2030, Cities for All: Implementing the New Urban Agenda". More than 25,000 participants attended, looking for solutions to make the cities of the future liveable, sustainable and resilient. KfW has a special role to play here as it promotes cities both in Germany and in developing countries and emerging economies. This was also reflected at the KfW event, which covered a large area ranging from Germany to India. The discussion at KfW focused on how, among other things, cities can access more money. In his opening speech, Head of Division at BMZ Franz-Birger Marré argued that the cities themselves bear a great responsibility for their own development, but at the same time, support from financiers such as KfW Development Bank and national governments is essential. In addition, the mayor of the city of Mannheim, Dr Peter Kurz, emphasised that the administrative groundwork must be laid at national level "so that cities are actually able to stand on their own feet financially". This means, for example, that cities need sufficient autonomy to obtain financing and spend the money independently. His colleague from the southern Indian city of Kochi, Soumini Jain, said: "Every city is different and needs tailored financing approaches." Cities vary greatly in their economic strength, social and political constitution, and geographical location. In this context, Ms Jain explicitly praised KfW's financing of water taxis in Kochi as a customised solution for a city that spans several islands. More approaches of this kind are needed. The panel discussion was followed by a lively discussion with the audience, which highlighted two things in particular: cities want more administrative and economic autonomy to be able to implement urgently needed projects better and faster. And: cities need sufficient financial resources — from various sources — to carry out their important tasks. The cities of Mannheim and Kochi have taken the first steps in this direction, and KfW will continue to support them and many other cities on this path, as affirmed by their representatives in Kuala Lumpur.